This is a topic that has been discussed often recently, but it’s worth highlighting it again — US equities have been crushing Chinese equities. 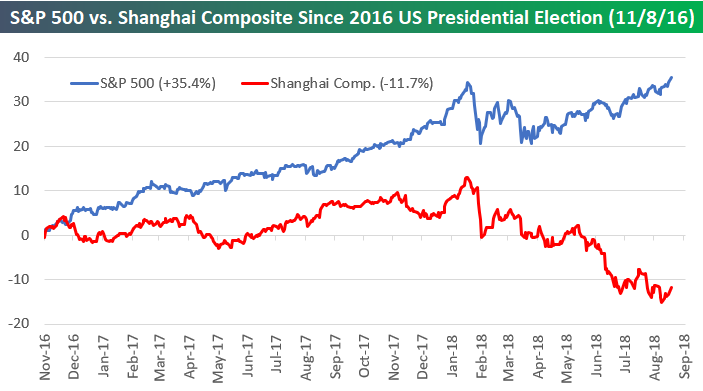 Below we show the performance of the S&P 500 versus the Shanghai Composite since President Trump was elected in November 2016. As of yesterday, the S&P was up 35.4%, while the Shanghai Composite was down 11.7%. While the US has led China throughout Trump’s entire term thus far, we’ve seen significant divergence since the US/China trade battle really began to heat up earlier this year. As US equities have rallied over the last few months, Chinese equities have fallen lower and lower.